As Southern Californians, we are constantly looking for new California weekend getaway destinations to explore. We found one of Central California’s secret getaways in Santa Maria. Santa Maria is probably more popular among visitors coming from other countries than among travelers living in the United States. This is something that should change because Santa Maria is a quick California getaway with many varied attractions for travelers. If Santa Maria is known at all, it is known for its wineries, but Santa Maria has so much more to offer including one of California’s best missions, farm-fresh produce, lip-smacking barbeque, hikes with stunning vistas, and quaint museums. Missions are the oldest structures we have in California. Just south of Santa Maria in Lompoc is La Purisma Mission, the most fully restored of California’s preserved missions. The mission can be visited on a self-guided tour, but we joined the two-hour guided tour which is provided every day at 1:00 p.m. We were surprised to find half our tour group was comprised of travelers from various countries in Europe. Our guide explained that while Santa Maria is off-the-beaten-path for American travelers, La Purisma Mission is listed in guidebooks available to European travelers as one of the best California missions to visit. Before the Spanish came, this area was inhabited by the Chumash Indians. Chumash translates to “the people who make money” and they were called that because while other Native Americans traded goods, the Chumash created a type of money made of shells on a string. The Chumash were also different from other Native Americans because they had ocean-going boats which they used to travel from the mainland to the nearby Channel Islands. When Juan Cabrillo was sent from Spain to the Americas, he sailed up the coast from Mexico to San Diego, Santa Barbara, and beyond. He found the Chumash Indians living their simple lives and reported back that there was nothing worthwhile in these parts. No one came again to the area for 200 years until the Russians started hunting sea otters in Alaska for their pelts and began expanding down the coast all the way to San Francisco where they built a fort. Worried the Russians would keep heading south, the king of Spain sent Catholic priests to set up missions. La Purisma was founded in 1787 and was the 11th of the 21 Franciscan Missions in California. The Chumash Indians were baptized into the Catholic Church and helped build the first mission. In 1812, numerous earthquakes destroyed the mission and a new mission was built a few miles away, the current location. The mission thrived and was known for its hides and blankets, but then the missions were discontinued and abandoned in the 1830s. La Purisma fell into ruins. In the 1930s, after the Great Depression, the government commissioned the Civilian Conservation Corps and the National Park Service to restore the mission, making sure to restore La Purisma to exactly what it had been before. Today, tours lead through all parts of La Purisma Mission including the cemetery, church, soldiers’ quarters, jail, weaving shop, padre’s residence, and outdoor areas. If you can, try to join the guided tour where you will learn so much more about the history and workings of La Purisma Mission. An added bonus is you’ll be able to ring the church bells, which you can’t do if taking a self-guided tour. La Purisma Mission State Park is dog-friendly, including the guided tour, though dogs are not allowed into the visitor center museum. If you’re looking for a pretty hiking trail during your Central California getaway, look no further than the Oso Flaco Lake Trail. This unusual hiking trail follows a boardwalk that crosses the middle of Oso Flaco Lake and then heads through the dunes before reaching the Pacific Ocean. The boardwalk trail is approximately a mile and half one way. Set aside at least an hour and a half for the walk so you’ll have time to stop and enjoy the views. The Oso Flaco Lake Trail is part of the Guadalupe-Nipomo Dunes area, the most ecologically diverse dunes complex in California. The dunes complex stretches from Pismo Beach in the north to Point Sal in the south. The dunes are full of plants and animals, some of which are rare or endangered. The waters of Oso Flaco Lake are filled with bluegill, hitch, largemouth bass, and goldfish. Growing around the lake are examples of dune plant life such as Dune Buckwheat, Beach Bur, Arroyo Willow, Beach Saltbush, Sand Verbena, Dunes Paintbrush, Beach Evening Primrose, and Blochman’s Leafy Daisy. Oso Flaco Lake provides great bird watching opportunities with American Kestrels, Barn Swallows, Ruddy Ducks, Cliff Swallows, Double Crested Cormorants, California Least Terns, Northern Mallard Ducks, Cinnamon Teal Ducks, Ospreys, and Brown Pelicans. I love movies, especially old movies, so I’m always excited when one of my travel destinations has ties to a movie. A number of movies have been filmed a few miles up the road from Santa Maria. Movies that have been filmed at the dunes of Guadalupe and nearby include Pirates of the Caribbean: At World’s End, Hidalgo, G.I. Jane, Sahara, and many others. The most interesting movie story from the area is that of the 1923 silent film The Ten Commandments. Cecil B. DeMille directed this epic Hollywood film and built for it the largest set in movie history at that time. Rather than the set being taken apart and carted away when filming was complete, DeMille decided to have the entire set buried in the sand of the dunes. It became known as the “Lost City of Cecil B. DeMille” even though the people that lived in the area never forgot. In 1982, Los Angeles filmmaker Peter Brosnan decided to embark on a quest to unearth the lost city as part of an idea for a documentary. He began working with an archaeologist in 1990, but the project didn’t go very far because there wasn’t enough funding. After a couple false starts some of the movie set was finally excavated in 2014 and is on display at the Guadalupe-Nipomo Dunes Center. The Dunes Center museum has been open for almost 16 years. The relics from The Ten Commandments comprise its most well-known exhibit, but also on display are exhibits about the Chumash Indians, who have been in the area for over 10,000 years, the natural aspects of the dunes, and the cultures of the residents of Guadalupe. After visiting the Dunes Center, head a few miles south and visit the Rancho Guadalupe Dunes to try to catch a glimpse of where The Ten Commandments movie set remains buried. You can’t actually walk up to the dune, but you’ll recognize it because it’s the one that has a lot of debris. Driving through the Guadalupe Dunes is kind of like driving through mountains of snow. The dunes’ sand drifts across the road, almost completely covering the pavement in some parts. While driving through the dunes, we passed an area that looked more like swamp land and were treated to the sight of some wild boar traipsing through the water. If you visit the dunes between March and October, you will notice that part of the dunes are closed to protect the Western Snowy Plover, a tiny shorebird that weighs less than two ounces. The dunes are where the plovers come to breed and nest. If you walk along the beach you’ll need to keep your eyes open for nests in the sand and chicks on the beach. Santa Maria has a small airport that is mostly for private planes, though two airlines run commercial flights to Santa Maria from Los Angeles and Las Vegas. At the far end of the airport is a museum, the Santa Maria Museum of Flight, where we learned more about the airport, Santa Maria, and the eclectic mix of flight exhibits curated by Mike Geddry, a Vietnam vet who gave us an informative and fascinating tour of the museum (accompanied by his beautiful service dog Kayla). The Santa Maria Airport was originally built as the Santa Maria Army Air Base to train bomber pilots for World War II. The Santa Maria Airport is also named after Captain G. Allan Hancock who founded the Hancock College of Aeronautics which trained the army pilots. After the war the airstrip eventually became a public airport. The Santa Maria Museum of Flight has been around for 31 years, but has been on the airport property for 27 years. Part of the museum is housed in a wooden hangar that was created as a movie set for The Rocketeer. In that building are model airplanes of all sizes, a costume from The Rocketeer, the museum’s library, and one of three still flyable 1929 Fleet Biplanes painted in the colors of Hancock College. Outside are some more real planes including an F-4 Phantom, a homebuilt general aviation aircraft, and an airplane from World War II, though it never actually flew in combat. Inside the second building of the museum are more airplanes, including a prop from The Aviator. Other exhibits include a piece from the Challenger Space Shuttle, something I found moving as that may be the first disaster I experienced and comprehended as a child, and a section dedicated to The Ninety-Nines, an organization of women pilots founded in 1929. Outside of the museum is a memorial garden celebrating The Ninety-Nines. One of Santa Maria’s claims to fame is the Santa Maria Style Barbecue. Barbecue is so important in Santa Maria they’ve even got an official Santa Maria Valley barbecue website. Santa Maria’s barbecue roots go back to the mid-1800s when the Santa Maria Valley was filled with ranches. Traditional Santa Maria Style Barbecue is tri-tip rolled in a mixture of seasonings and barbecued over red oak coals before being sliced and served in a French roll with fresh salsa. My favorite classic Santa Maria tri-tip sandwich with fresh salsa was from the Filipino Community Center Barbecue Food Truck which can be found in the Smart & Final parking lot on South Broadway. Since Romeo is Filipino, of course we had to patronize the Filipino food truck. We also learned at the Dunes Center that there is a large Filipino community in the Santa Maria area. The tri-tip is barbecued truck-side on the outdoor grill. The food truck is a fundraising operation and proceeds go toward the Center’s building and scholarship funds. We grabbed tri-tip sandwiches and fresh salsa to go and enjoyed them at our first wine tasting stop, Riverbench Winery. There is nothing more perfect than sipping a glass of Santa Maria wine and dining on a tri-tip sandwich while sitting in the sun with views of the Santa Maria Valley vineyards. Another place to get tri-tip sandwiches is Orcutt’s Old Town Market, a wine shop and deli that includes Santa Maria barbecue on the menu. For fancier Santa Maria barbecue, head to Santa Maria’s fine dining establishments. Romeo decided to go all out and get prime rib for dinner both nights. Our first night we dined at Vintner’s Bar & Grill, a restaurant located inside the Radisson Santa Maria. The second night we ate at the Garden Room Restaurant at The Historic Santa Maria Inn. The Santa Maria Inn has been around since 1917 and has had many famous guests throughout history like Cecil B. DeMille, William Randolph Hearst, and Marilyn Monroe. The hotel, including the restaurant, feels old-timey with wood paneling and paintings on the wall. While Rome had the prime rib, I went for one of their other steakhouse specialties, the New York striploin with a cabernet reduction and bleu cheese butter. Another plus for the Garden Room Restaurant is the dining area in the outdoor courtyard is dog-friendly. Santa Maria is a small town surrounded by even smaller towns like Guadalupe, Orcutt, and Sisquoc. Between these small towns are acres and acres of fields growing fresh produce. As we drove through the fields we smelled the aroma of upturned earth and fresh-cut greens. We spotted tractors and other farm vehicles driving through the fields and witnessed farm workers picking, sorting, and packing the harvest of the day. A 2014 report from the California Strawberry Commission, as cited by the Santa Maria Times, states California’s strawberry farms grow 90 percent of the country’s strawberries. Strawberries are a huge part of Santa Barbara County’s income, the county in which Santa Maria is located. While we were driving around we noticed a few fields marked with signs for Darensberries, one of Santa Maria’s strawberry growers. We got to sample the berries from those fields when we visited Darensberries’ berry stand on the corner of East Betteravia and Nicholson Avenue. The red, succulent strawberries being sold were picked earlier that day and were perfectly sweet and juicy. The San Ramon Chapel became the first historical landmark in Santa Barbara County in 1966 when it was called the Benjamin Foxen Memorial Chapel. The Foxens were an important family in the Santa Maria Valley (the main road is called Foxen Canyon Road). The property was purchased by Frederick and Ramona Foxen Wickenden. Three years later Frederick Wickenden sold 5,000 sheep to purchase the building materials for the chapel. Fred Foxen, Thomas Foxen, and Chris Clausen built the chapel in 1875 and the remains of Benjamin Foxen were moved to the cemetery in 1876. The chapel is now named San Ramon Chapel because it was placed under the patronage of San Ramon, the patron saint of farming and agriculture, in 1879. The chapel is not always open, but it does hold services on Sundays and at other times visitors can walk through the cemetery and around the outside of the chapel. One of Santa Maria’s main draws is that it is wine country, so if you enjoy wine, a trip to Santa Maria would not be complete without making some stops at a few wineries. Many of the wineries are close together on and around Foxen Canyon Road. We visited four wineries during our trip, all of which were unique. Riverbench Winery’s tasting room is in a refurbished farm house that used to be part of a dairy farm. Wine tastings can be enjoyed in the tasting room or outside on the lawn at small café tables. Down the street is Rancho Sisquoc Winery, with a tasting room in a rustic looking wood cabin. Nearby is Kenneth Volk Vineyards, where wine tastings are served in a warehouse filled with wine barrels. Cottonwood Canyon Vineyard and Winery is a larger, brightly colored wine tasting facility complete with a wine cave which visitors can tour and where they can experience a barrel tasting. All of these tasting rooms are dog-friendly. This entire trip to Santa Maria all started because we were invited by Club Carlson to stay at our choice of any of their properties to help promote #AroundTheWorldIn75Days. Club Carlson not only has a property in Santa Maria, the Radisson Santa Maria, it is also the highest rated Santa Maria hotel on TripAdvisor. What makes the Radisson Santa Maria unique is its location along the Santa Maria airport and rooms that have runway views. For more information, read my full review of the Radisson Santa Maria. If you’re looking for an off-the-beaten-path California weekend getaway, consider heading to Santa Maria, a great destination for a quick getaway with a number of Central California attractions. 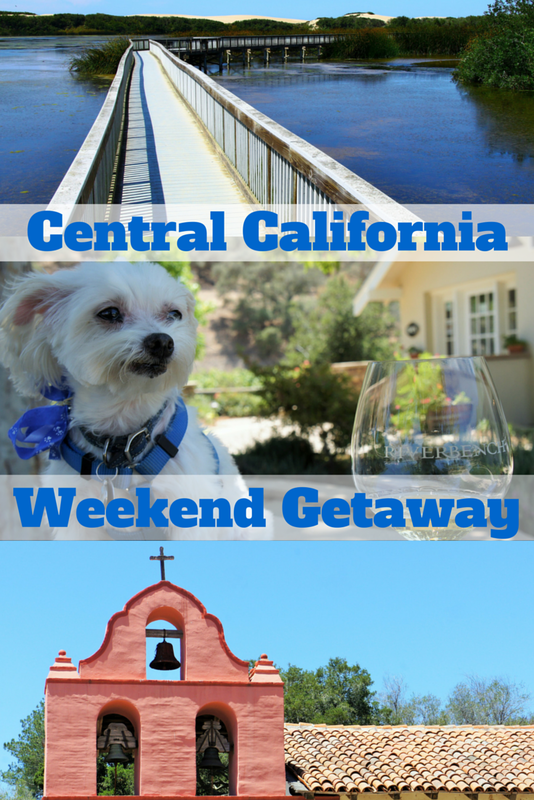 Santa Maria is a fun weekend getaway for history, hiking, and great food and drink. Santa Maria is a great Central California road trip destination. Thank you to Club Carlson and the Santa Maria Valley Chamber of Commerce Visitor & Convention Bureau for hosting our visit to Santa Maria and making this post possible. As always, all opinions are my own.